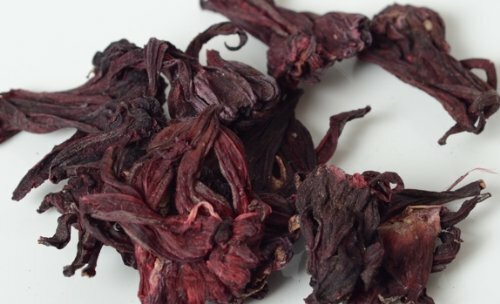 Dried Hibiscus Flowers, also known as: Hibiscus sabdariffa, red sorrel, African Mallow, Indian Sorrel, Jamaica Sorrel, Jamaica Tea Flower, and Roselle. Hibiscus flowers are the main ingredient in many wonderfully refreshing teas made around the world, especially in Mexico, Latin America, and North Africa. A tea known as Agua de Jamaica, or simply Jamaica in Mexico, is usually served chilled with copious amounts of sugar to sweeten the natural tartness of the hibiscus. Hibiscus tea is known for boosting the immune system and fighting off infections. Traditionally, hibiscus tea was regarded by the Egyptian pharaohs to be royalty’s most important beverage as it was known to improve health and vitality. The antioxidants found in hibiscus tea are often compared to those in red wine and have been noted for their positive effects on cardiac health including lowering cholesterol and triglyceride levels. These antioxidants also contain powerful properties which have the ability to protect cells and keep them healthy and free from damage. Hibiscus tea is also known to be beneficial for weight loss, depression, sleep disorders, hypertension, and mood swings. Hibiscus tea also is known to help lower blood pressure, prevent bladder infections, and relieve constipation. Hibiscus has been used for centuries to support liver function and aid in liver disorders such as fatty liver syndrome and jaundice. Hibiscus tea can be consumed either hold or cold. Some from Iran drink hibiscus tea as a traditional aid for restlessness and sleep. Mexicans use hibiscus tea as a natural diuretic. People from Asian countries such as Thailand, China, and Malaysia, consume hibiscus petals and flavor them with ginger as they believe this could help lower cholesterol. This entry was posted in Teas.